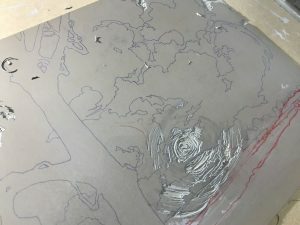 I thought it would be interesting to write a blog explaining exactly how I make one of my linocut prints. 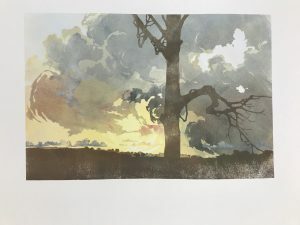 This print, called Vale Raking Light is a great candidate for a thoroughly nerdy piece with plenty of technical detail and hopefully some helpful ideas. Raking Light is a reduction linocut using traditional artists/battleship lino, printed in oil-based inks onto Fabriano Rosaspina paper using an Albion printing press. By reduction printing, I mean that the whole print is created from one piece of lino (which I’ll refer to as the block in this blog). 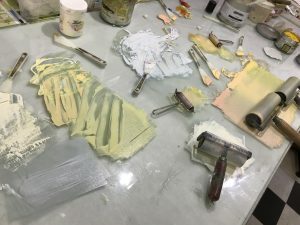 After each layer of colour is printed, more is cut from the block until the print is finally finished and the block destroyed. This print has fifteen layers of inking in all. 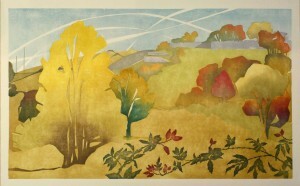 I use Intaglio Printmakers oil-based inks with the addition of their extender and cobalt drier. Extender adds transparency to the inks, like adding water to watercolour paint. A scant drop of cobalt drier to a tablespoon of ink will speed the drying time of oil-based from days to hours. I use oil-based ink because I find it much more sympathetic to colour mixing: what you see is what you get. 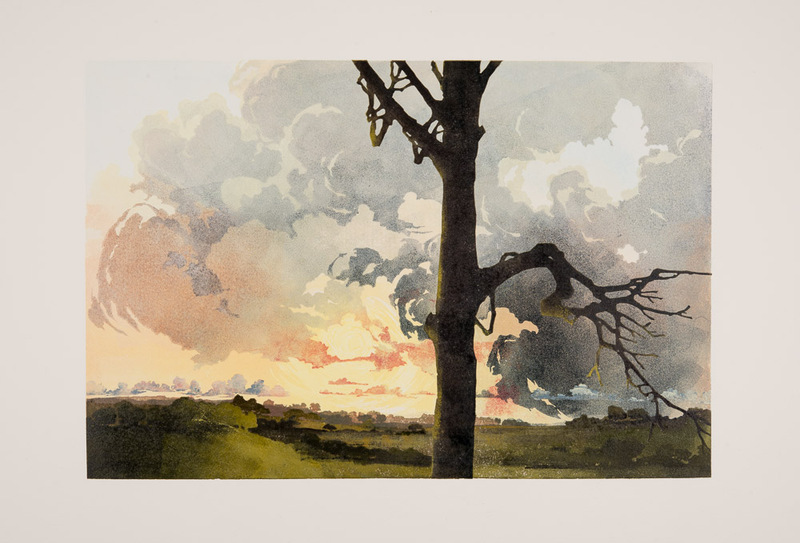 With water-based ink, the colours look edgier and often darker on paper as opposed to the mixing slab and can look chalky with the addition of white. Importantly I can work light to dark and, less conventionally, dark to light with oil in ways impossible in water-based ink. I also avoid the danger of the paper cockling with damp ink. This can be a problem with water-based inks, especially since I often work with many layers of ink. Raking Light began with a sky spotted from the car. I lurched to a halt on the road into Aylesbury and took photos on my phone. 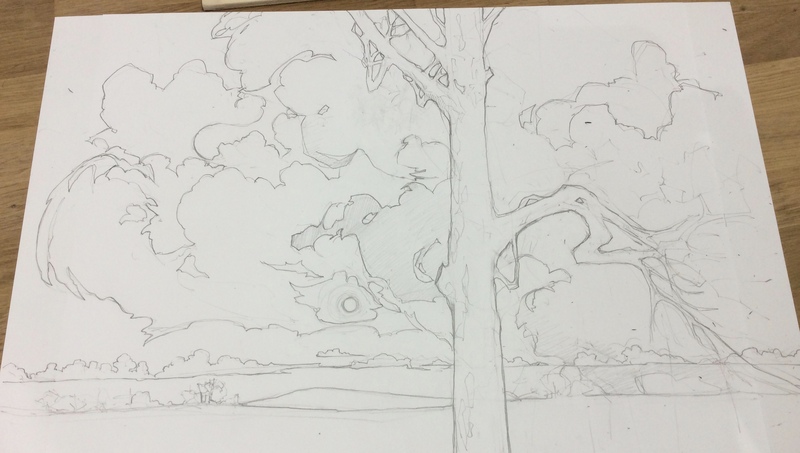 Usually I make sketches too, but not this time, not on the A413. I used these photos to work up this design drawing ready for transfer to the lino. I assemble my landscapes in my studio with the help of source material. I’m far more interested in catching the feel of a place rather than making an accurate representation of a specific location. That way the viewer is free to make the landscape their own while I, in turn, am free to arrange the composition to my own satisfaction. You’ll see the land change shape later as the print progresses. I made a tracing from my drawing to transfer the lino to the block. I use Polydraw plastic tracing film for all my tracings. Polydraw is completely stable, no swelling or cockling even if it is splashed with water, unlike conventional tracing paper. I flipped the tracing over to reverse it (so that the print would appear in the same orientation as the design drawing, rather than as a mirror image) and transferred it onto prepared lino using carbon paper. I prepare my lino by giving it a light sanding with fine sandpaper to key the surface and then stain it with red ink much diluted with white spirit. I wipe the dilute ink on with a cloth, leave it for a few minutes and then rub off the excess and wipe over with white spirit to finish. The carbon paper I use is office carbon and it can transfer to the print unless it is treated. To prevent transfer with oil-based inks, I leave the carbon to ‘set’ for an hour or so and then wipe over thoroughly with white spirit. This reduces, but doesn’t prevent, transfer when using water-based inks, for those I suggest making some sacrificial prints to allow the carbon transfer to fade before starting to print properly. This photo shows the lino with the first layer of ink applied for printing. I used a combination of different rollers to apply the ink. Here I have at least three rollers on the go and am inking only where I feel it is appropriate. 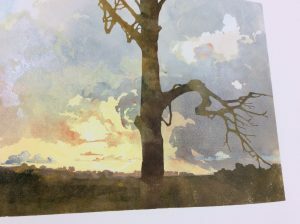 With this approach, you can either just add more ink between each impression, accepting that the image will become softened and blended with each application, or you can wipe down the block between each print so that the painterly application of ink is fresh in every print. I dot between the two methods depending on what I’m doing. This is the lino showing my early cutting. The red is chinagraph pencil and the blue lines the carbon. I used the chinagraph to resolve the landscape as I went – it changed significantly right up until the end of printing thanks to how the work developed. I may start with a design drawing, but it is never set in stone and I often change and adapt as I go. I never make a colour study or plan of any sort either. This seat of the pants approach means I am constantly responding to what the work needs rather than being restricted by preconceptions. 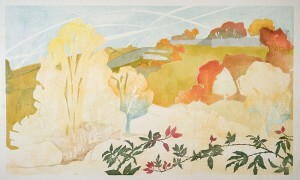 This is an early impression showing the mix of roller-applied colour in the sky. The ink is mixed with extender at about 95% extender for great transparency. Using so much extender comes at a price: it can make the ink sticky and stringy, flicking it up onto the bar of the roller where drops can drip back down onto the print (solved by keeping and eye out and wiping down regularly). This dilution also requires a good deal more work with the roller on the lino than normal to even out the ink if you want a smooth transparent layer. I use a little ‘tack reducer’ added to the ink to make it flow better and be less sticky. Tack reducer looks like Vaseline and a small amount added to oil-based ink will help it to flow on cold days and eases the stringiness of extender-heavy inks. Here is my slab showing the various colours and rollers. I always mix using the previous colours as a part of the new colour. This started out as thrift in my student days, but now is more a matter preference for a harmonious palette. This picture shows the build up of the sky, very transparent and painterly. I enjoy the contrast between the definite cut line in my work and the vagaries of my inking. This makes for an edition where the prints all share the same colours and cutting, but the application of the ink varies. I have no issue with this, making numbered photos available for clients and galleries to select their preferred prints and have never had a problem commercially. If I reach a point where the variation pushes the notion of an edition too far, I will sell the prints as a series. This series of photos shows the build up of the landscape. The land remained a quandary and, if I’m honest a bit of an irritation, until I started work on it, then it became my favourite part of the print. The first couple of layers of land had almost as much extender as the sky to give it luminosity, but as I got closer to the foreground, I reduced the extender to less than 20% and then removed it all together for the last couple of layers. I didn’t decide what to do about the tree until the end, but kept my options open by putting on some ink at an early stage to see how it looked. I didn’t ink the tree at every stage so that it would stay crisp and detailed when finally printed. I always avoid over-inking areas of fine detail if I can. 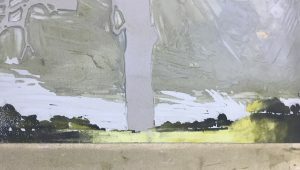 These two photos show the lino with a painterly application of bright ink that is going to print over dark ink, then the subsequent print (see how I am now ignoring the tree). 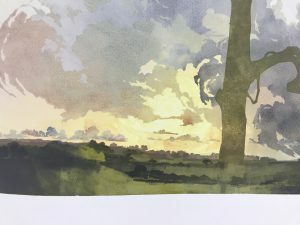 While oil-based ink makes it possible to work light over dark, you need to make the lights overly bright, as the darker base layer will always knock paler ink back and subdue its tone on the print itself. 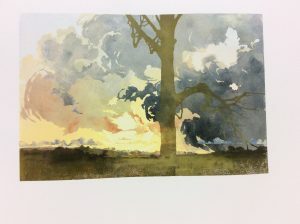 Below is the final result again showing the finished tree which I printed in one hit, highlights and all. I began with fourteen pieces of paper and ended up with fourteen finished prints. This takes a good deal of experience and nerve. The reduction process doesn’t allow for test proofing or going back and printing more. If you are new to the process, either allow yourself some extra prints for mistakes or accept you could end up with a very small edition (I do remember going from twelve down to one back in the early days, necessitating a cry and probably some chocolate biscuits). If you want to see the variation in inking you can look at the prints in succession here. Better still, if you’d like to buy one, click here. If you want yet more advice insight and help, you can scour my resources pages here or join me on Facebook or Instagram where you’ll find me as Laura Boswell Printmaker. On the face of it, an artist’s residency seems like a bit of a jolly. Five weeks to indulge. Indeed, ‘aren’t you lucky’ is something I have been hearing on a very regular basis. I wouldn’t argue with the fact that I am lucky, but what I see as luck may not be the same as the luck implied in the comment. 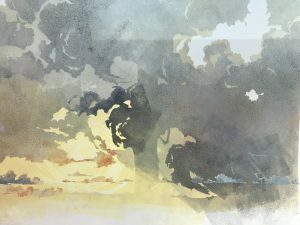 Artists like me have the luck of possessing the drive to stick with a technique and work through the catastrophes, goofs and setbacks to get to a point where we can be good enough to be considered for residencies. After that, luck is out of the equation: selection committees select, they don’t tend to pull names at random from a hat (at least I’ve never been on one that’s done that, however dull the evening and close the pub). The residency also brings responsibility. I am giving up earnings, cancelling a workshop or two and putting family on hold to go out there. I’d better have something to show for it when I get back. I’m gambling that five weeks far from my comfort zone will result in a move forward in my work. I don’t doubt it will be a marvelous trip and I am certainly not asking for sympathy. I’m more explaining that a residency has to mark a point of change for my work or I will have failed and not be lucky at all: I’ll just have been self indulgent. 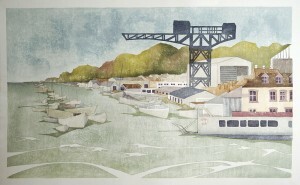 Getting your Japanese woodblock prints to dry flat. 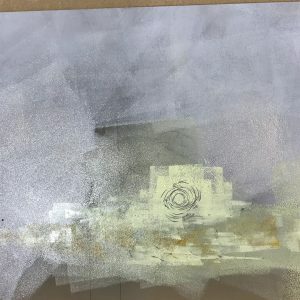 Paper has a hard time in my hands as a printmaker. I put it through all sorts of stresses and strains on the way to making a print and still expect it to finish up as a pristine, flat sheet of loveliness at the end, though hopefully with a layer or two of colour on top. Oil based lino prints aren’t a problem. I’ve been doing them a long time: I use Zerkal paper (like most of the printers I know) and it works a treat, staying nicely flat under the pressure of my Albion press. The clever bit for me here is keeping my filthy hands off the edges of the print. The Japanese printing I do is a whole different story: this is a watercolour process, the paper is damp and I am constantly stretching the paper with hand rubbing in different places. 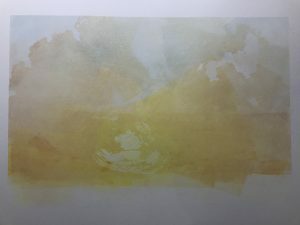 The Fabriano I use, while very good tempered about taking the paint, can be very hard to dry flat, especially if the print is large. I have very recently, after lots of stacking and balancing acts with everything from those big cookery books, the sort with just the one great recipe, to old bricks, discovered a way to resolve the problem. I now use two large sheets of birch carpenter’s ply held absolutely tight together with butterfly clamps. Butterfly clamps are a builder’s equivalent of a peg, but massively stronger and much larger. I bought mine off a puzzled man in my local market at £1.50 each. They have rubber over the gripping mechanism which protects the ply should you later want to turn it into a woodcut. Buy plenty: the more you clamp, the better. I put my damp prints straight onto the clean ply and put another sheet over the top (this is 5mm thick ply, it’s probably best to have it fairly sturdy) and simply clamp all the way around with my butterfly clamps. It takes about two days or so to work and the prints are beautifully flat at the end. The ply absorbs the moisture, then dries out and off you go again, though you must keep it clean. Keeping anything clean for me is a major challenge which is why I go on about it so much. There is another very occasional problem and it’s pretty much out of my control: pictures getting damp in frames and then coming back from wherever they have been shown cockled. These wrinkly prints can be both linocuts and woodblocks. With these, after stomping about a bit in temper, I remove from their frames and make up a sandwich of slightly damp blotting paper. I put the prints, oil based lino included, into the blotting paper parcel and allow the prints to get damp for about 4 hours or so. At this stage they become alarmingly wrinkly and look terrible. They then go into the ply and I dry them as before. The result is again a lovely flat print.